There are a wide variety of fountain pens available in the entry-level price range of around $20. Some on the lower-end of that price scale are excellent (the Platinum Preppy and Sailor HighAce Neo for starters), as are ones on the higher end like the Lamy Safari. While there are many good choices, there are poor ones as well, and unfortunately the Ohto Dude falls into the latter category. The Ohto brand has always appealed to me from a design perspective. Their barrel design ideas are interesting, and they generally pull them off very well (the Ohto Rook being the lone exception). Where they have been lacking - more times than not - is in the area of performance. Most importantly, where the nib meets paper. I should have learned my lesson with the Ohto Fine. That nib gave me serious problems at the time, and the cost of repair would be greater than the original price. I was hoping the unfortunately named Dude would be better. It was, but only marginally. What I have repeatedly experienced with Ohto fountain pens is the nib digging into the page. I don't mean that it is scratchy when I write - that is a different feeling - I mean that it is almost gouging the page. This made for a poor and inconsistent writing experience. I have learned my lesson with this pen. Ohto ballpoints and rollerballs are good pens but I am going to swear off any future Ohto fountain pen purchases. 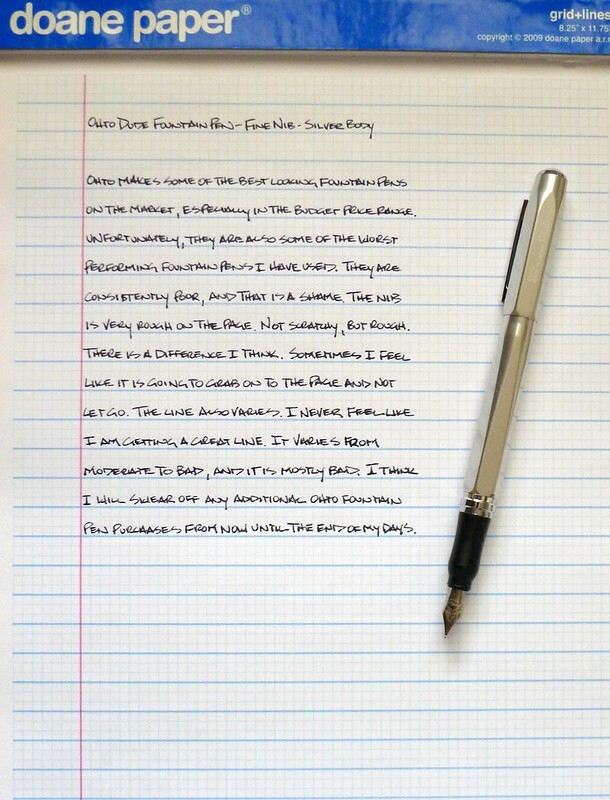 Posted on February 13, 2013 by Brad Dowdy and filed under Ohto, Fountain Pens, Pen Reviews.